and went down really well, thank you again! Great filming and brilliant editing." ensures you meet your marketing goals. facilitate effective employee training programmes. There are 3.7 billion internet users. On average, every single one of those internet users, watch 1.6 videos per day on YouTube alone. 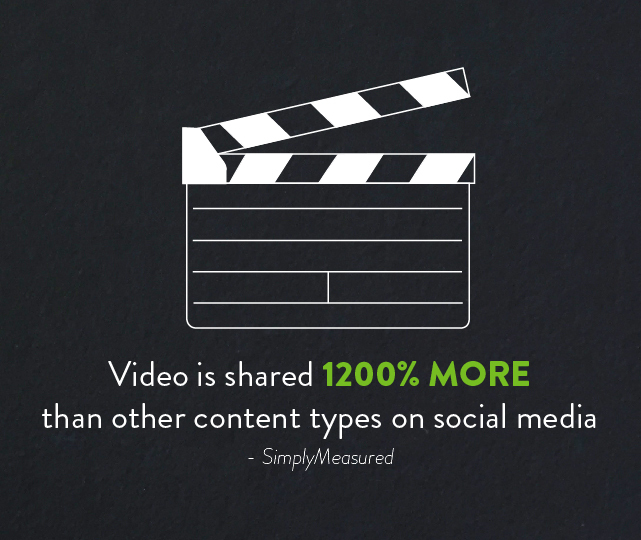 This staggering number doesn't even take into acount all the videos watched on Twitter, Facebook, Vimeo and business websites. Video is still the fastest growing form of communication with internet video traffic accounting for 80% of all consumer internet traffic by 2019. The appetite and demand for video content is clear and offers a huge opportunity for all businesses, from start-up to multi-national. What kind of video is right for me? This ultimately depends on your end goals and target audience. Is this an internal video for training purposes or explaining procedures to employees? Or are you trying to engage a new audience and potential customers? We have over 25 years experience in working with a wide range of companies, both large and small, and finding the right video solution for them. Talk to a member of our team today for friendly, honest advice on what's best for you. ...to develop an end-product that delivers your marketing goals on time and on budget. or external corporate marketing applications. compelling content that's relevant to your audience. products, services and training that work for you. Video Sounds great, but isn't it expensive? 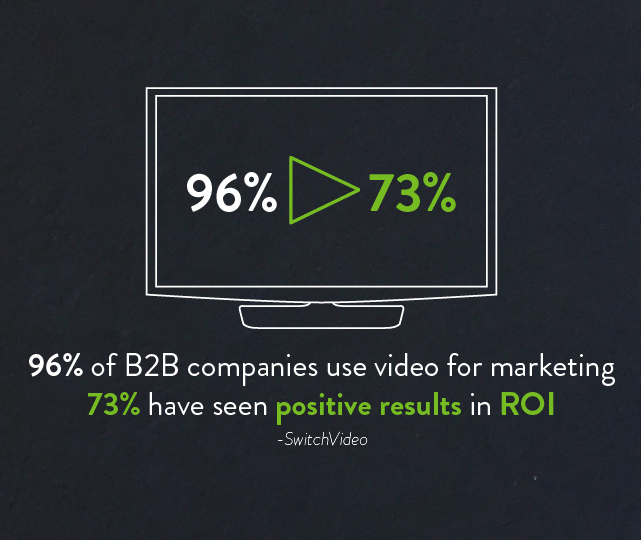 51% of marketing professionals worldwide believe video as the type of content with the best return on investment and 4x as many customers would rather watch a video about a product than read about it. 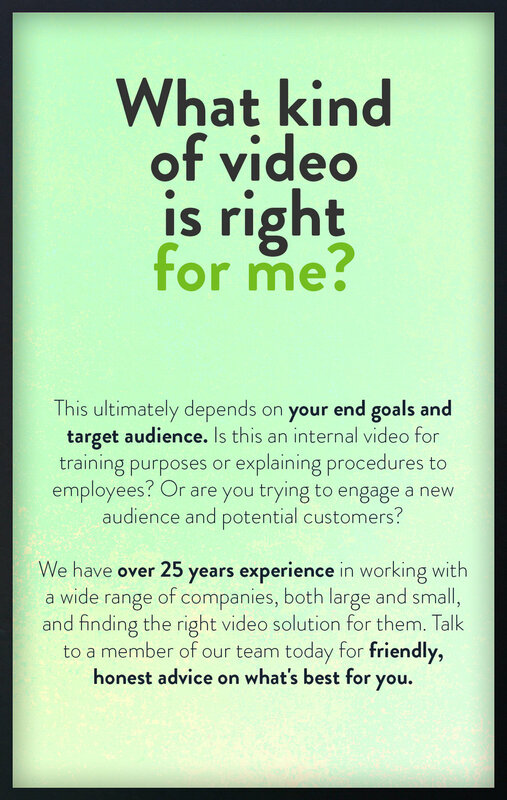 That's why we work with you, to make videos that are of high quality, deliver your message effectively and deliver a great return on investment. That's why over 70% of our clients contact us again within one year of their initial enquiry. What do you offer beyone 'standard' video? With a quarter century of experience, we specialise in both wide and multi-screen video production for large conference and events. These projects are often entirely bespoke for each event and that's why we take the time to fully understand both the needs of your business and the audience you are addressing, as well as offering advice on how you can make the most of your space to offer maximum impact.